Vienna: Austria and Rapid to share national stadium? 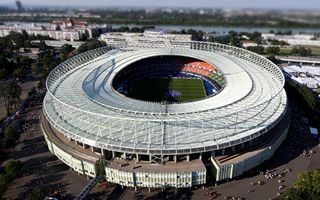 While there was some debate ahead Euro 2008 whether it would be good to relocate Austria and Rapid to the national stadium, such plans were scrapped. At least in the long run – the stadium is too big for both sides and would be hard to find a business model for. However, for a fixed period it’s entirely possible. Austria was the first club to announce their relocation for 2015/16. This is when they’re planning to redevelop part of their current stadium, the Generali-Arena. Meanwhile Rapid have just now confirmed they’re looking into the possibility of occupying Ernst-Happel-Stadion now, as their own stadium’s complete reconstruction is about to start in two months. The club is interested in holding both the 2014/15 and 2015/16 seasons at the national stadium, meaning at least a year of sharing with Austria, depending on how both stadium projects go.